It's easier to get a reservation at Manhattan's most glitzy celebrity-packed establishments than at a tiny, century-old East Harlem restaurant. But if you're available July 27 and have a few thousand dollars to spend, you may have a shot at getting in. The quaint restaurant, Rao's, is auctioning off dinner for four on eBay, with proceeds going to a nonprofit Italian-American foundation for educational programs, such as grants to study Italian or to pursue research in Italian studies. The minimum bid is $5,000. And the winners must dine on July 27; the restaurant is booked through 2010. "As of the moment, 2010 is completely filled and we are not accepting any reservations," says a woman's recorded voice on the restaurant's answering machine. There are just 10 tables in the small, corner restaurant with signed celebrity photographs on the walls. If you're lucky enough to get in, what awaits might be a bowl of ziti, pasta shells with ricotta sauce, some roasted peppers, baked clams, lasagna and meatballs. It's neither new nor unusual. Rao's is part of a disappearing breed of eateries in a city filled with hoity-toity Italian restaurants offering such fare as a $49 steak dressed with bone marrow (for an extra $12), or in another restaurant, lamb's brain pasta with lemon and sage, for $19. Instead, the East Harlem neighborhood joint provides old-fashioned Neapolitan-style comfort food. And aside from the eBay offer, diners say the price is right; a dinner can run about $80, or more with a fine wine. Reviewers praise the crispy baked clams that are juicy inside. The calamari apparently melt in your mouth. And they say the veal marsala and lemon chicken are top notch. "It is the true authentic Neopolitan food that my grandmother makes," says Michael A. Zampardi, a board member of the Washington D.C.-based National Italian American Foundation, which will get the proceeds from the auction. "I wouldn't say it was just a meal, it's an experience," says Zampardi after eating at Rao's. Owner Frank Pellegrino, nicknamed "Frankie No," doesn't accept customers without a reservation, and he was unavailable to comment. 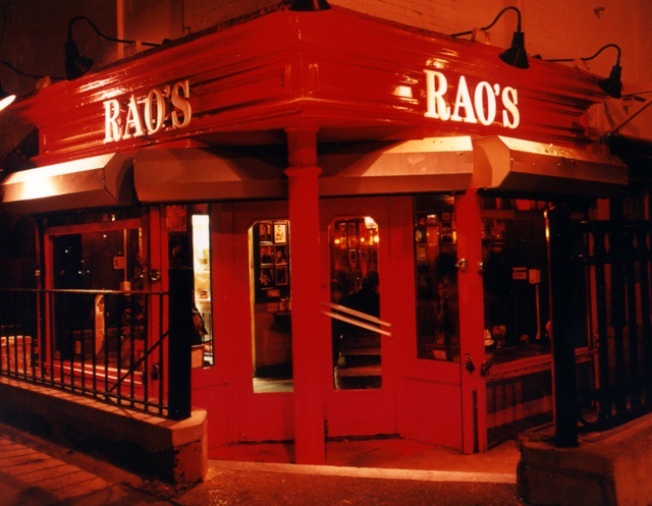 The Rao's phenomenon exploded in 1977, when New York Times food critic Mimi Sheraton gave it a three-star review. It no longer was a local secret. Pellegrino, an actor and singer, now markets the restaurant his family opened in 1896. This stint comes after roles in Martin Scorsese's "Goodfellas," Woody Allen's "Manhattan Murder Mystery," the HBO mob series "The Sopranos" and other movie and TV productions. Of course, his actor buddies occasionally show up at Rao's, which is a celebrity hangout. Pellegrino has made an industry out of the little eatery, sharing old recipes in his book, "Rao's Cookbook: Over 100 Years of Italian Home Cooking." He serves up more than just food. The restaurateur has produced a CD with music from Rao's jukebox. And he offers the dream recipe for success in New York, writing: "In New York it's here for you. There isn't anything in New York you can't see or have or attain. It's up to you..."
If you're not one of the lucky "0.000001 percent of the population that scores a table at Rao's," as one food blog puts it — you can order its sauces and pasta online.